Français 1.  Bonjour! ◦ Hello! ◦ Good morning! ◦ Good day!  Bon soir! ◦ Good evening!  Bonne nuit! ◦ Good night! 2  Bonjour! ◦ Hello! ◦ Good morning! ◦ Good day!  Bon soir! ◦ Good evening!  Bonne nuit! ◦ Good night! 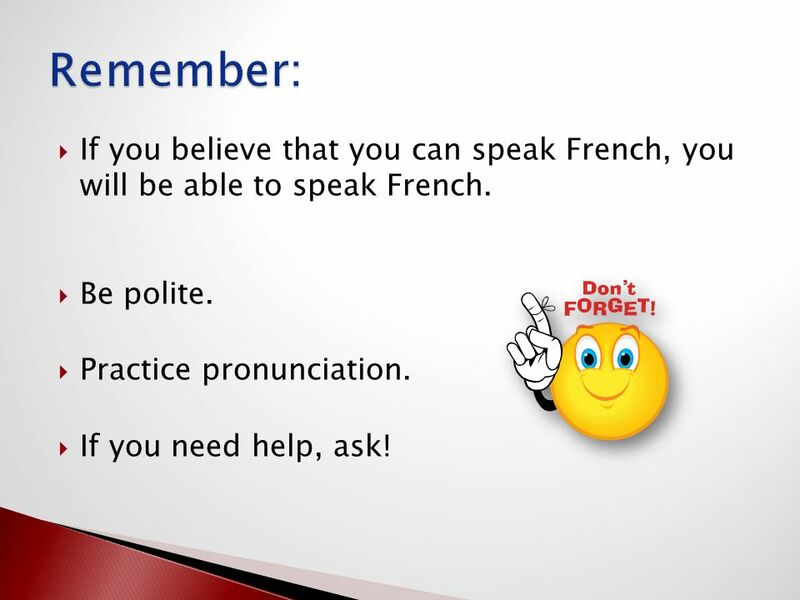 3  In French, it is common to address people by their titles. 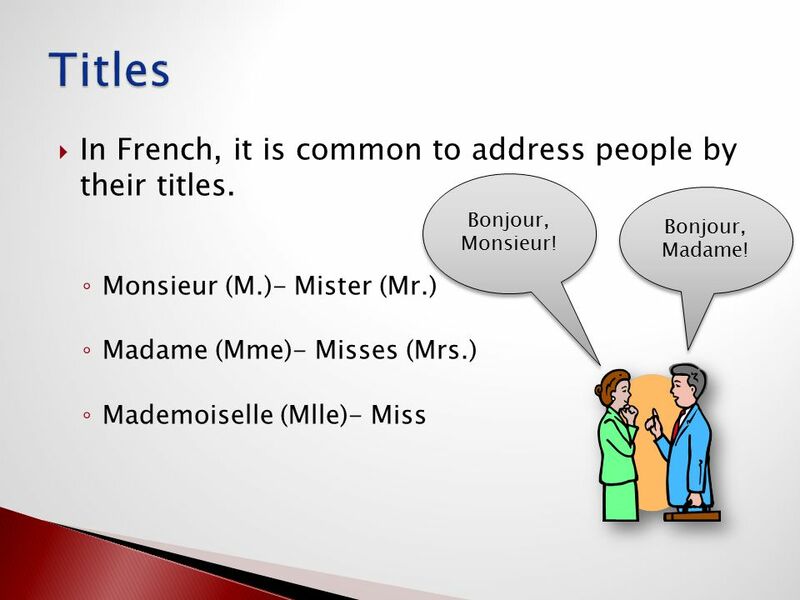 ◦ Monsieur (M.)- Mister (Mr.) ◦ Madame (Mme)- Misses (Mrs.) ◦ Mademoiselle (Mlle)- Miss Bonjour, Monsieur! Bonjour, Madame! 4  Salut! ◦ Hi! **Used for friends, family, and other people that you address informally. 5  When French people greet one another, they will either kiss each other on both cheeks or shake hands.  Kissing on the cheek is called “la bise”. (You’ll learn about “la bise” in the next section.) 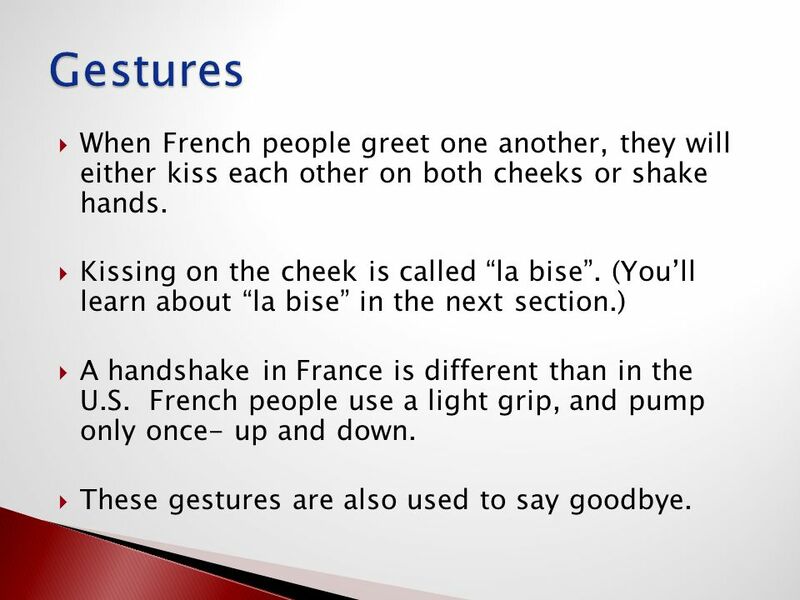  A handshake in France is different than in the U.S. French people use a light grip, and pump only once- up and down.  These gestures are also used to say goodbye. 6  Comment t’appelles-tu? ◦ What’s your name? 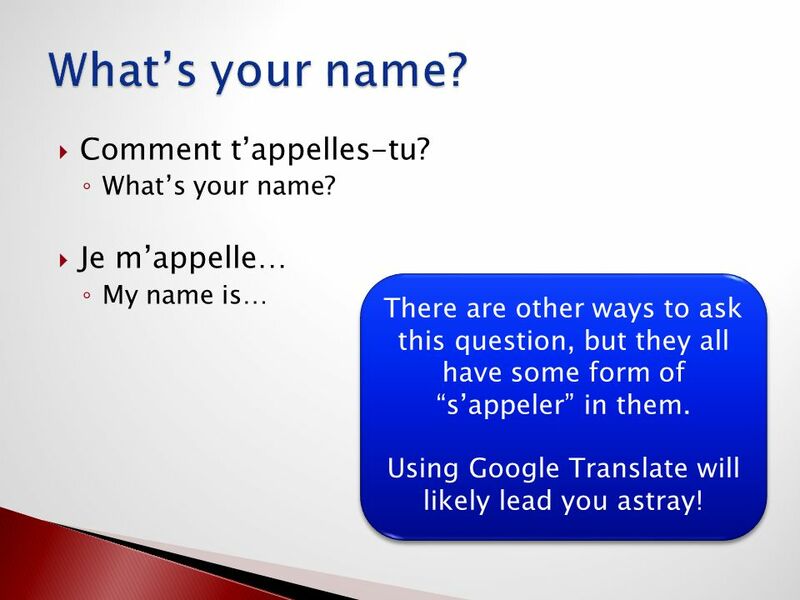  Je m’appelle… ◦ My name is… There are other ways to ask this question, but they all have some form of “s’appeler” in them. 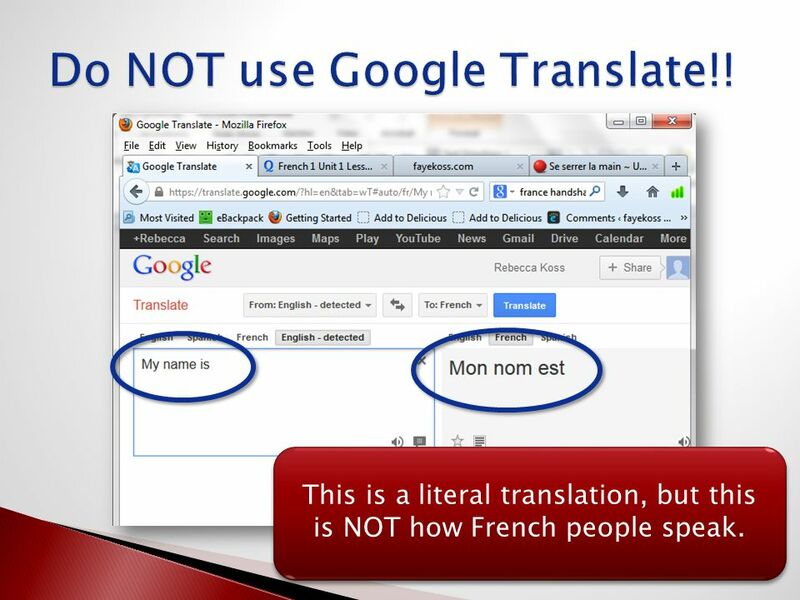 Using Google Translate will likely lead you astray! There are other ways to ask this question, but they all have some form of “s’appeler” in them. Using Google Translate will likely lead you astray! 7 This is a literal translation, but this is NOT how French people speak. 8  Take a minute to practice. 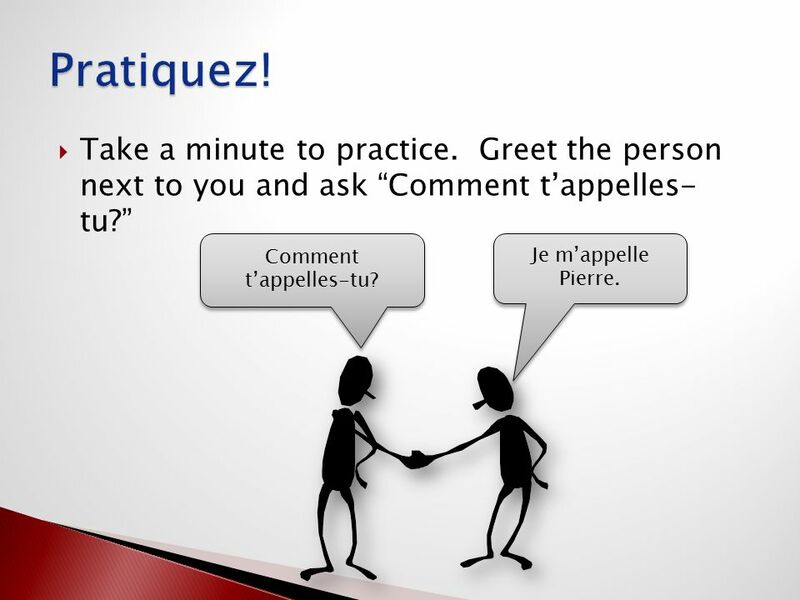 Greet the person next to you and ask “Comment t’appelles- tu?” Comment t’appelles-tu? Je m’appelle Pierre. 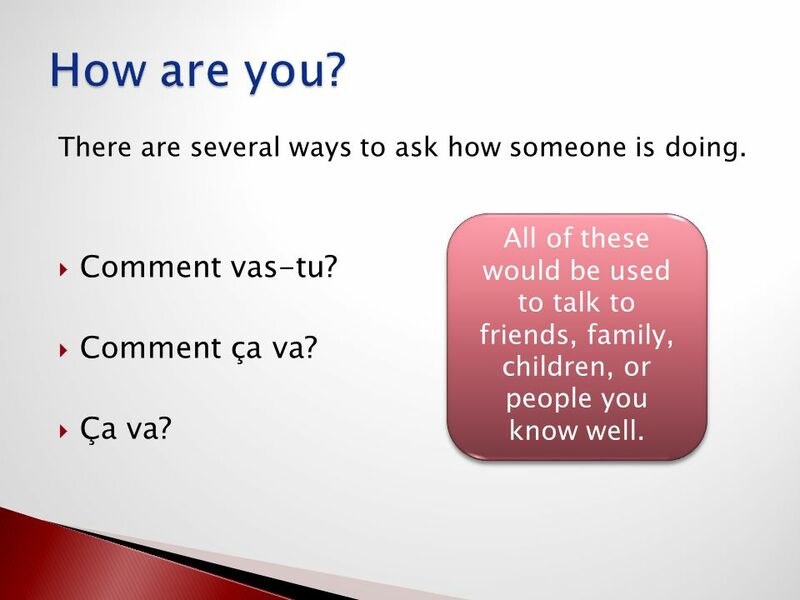 9 There are several ways to ask how someone is doing.  Comment vas-tu?  Comment ça va?  Ça va? All of these would be used to talk to friends, family, children, or people you know well. 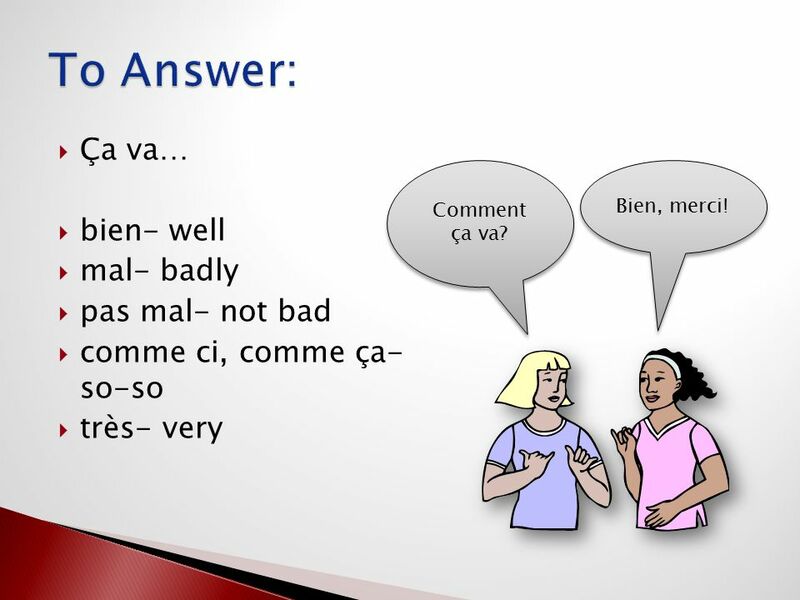 10  Ça va…  bien- well  mal- badly  pas mal- not bad  comme ci, comme ça- so-so  très- very Comment ça va? Comment ça va? Bien, merci! 11  Take a minute to practice. 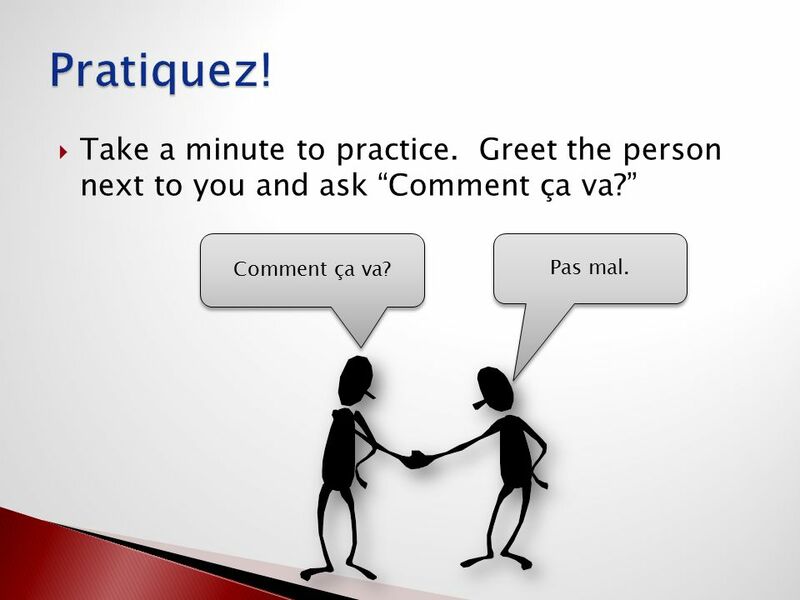 Greet the person next to you and ask “Comment ça va?” Comment ça va? Pas mal. 14  S’il te plaît. ◦ Please. 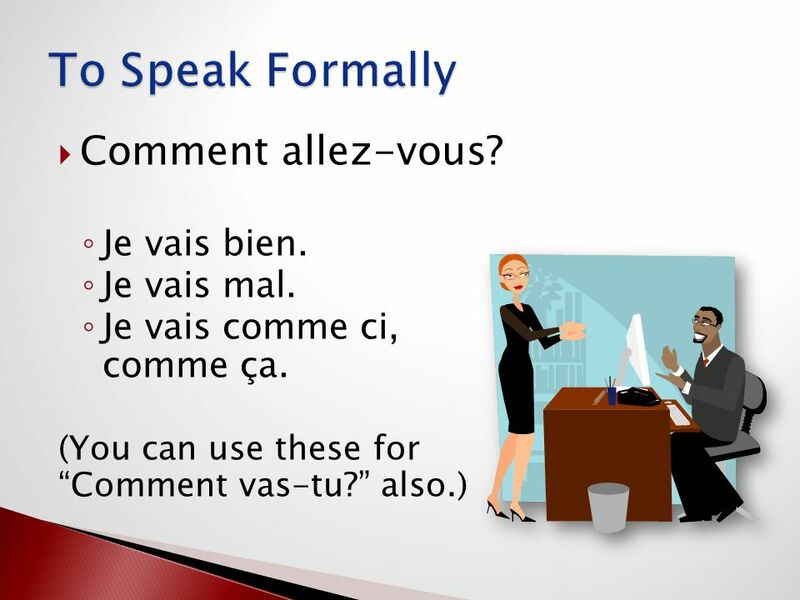 (talking to someone you know well)  S’il vous plaît. ◦ Please. 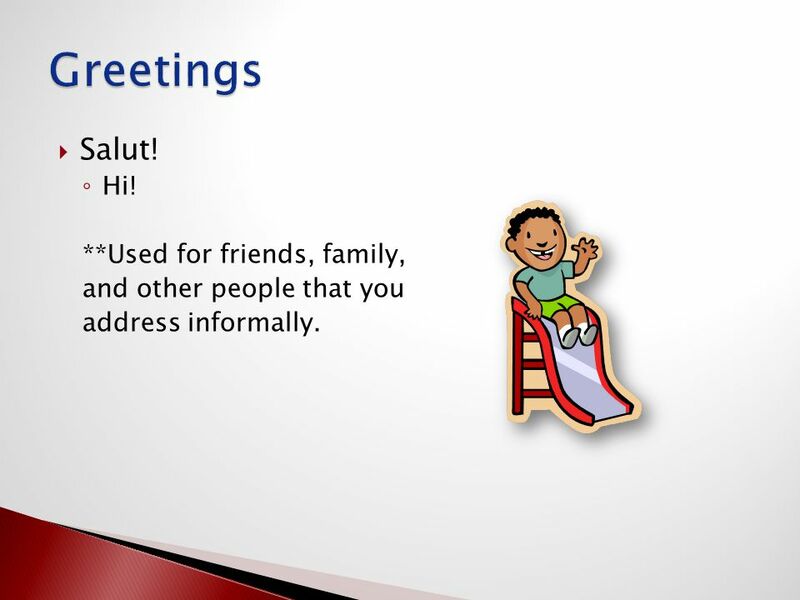 (talking to someone you address formally)  Merci- Thank you.  Merci beaucoup- Thank you very much.  De rien.- You’re welcome.  Pas de quoi.- You’re welcome. 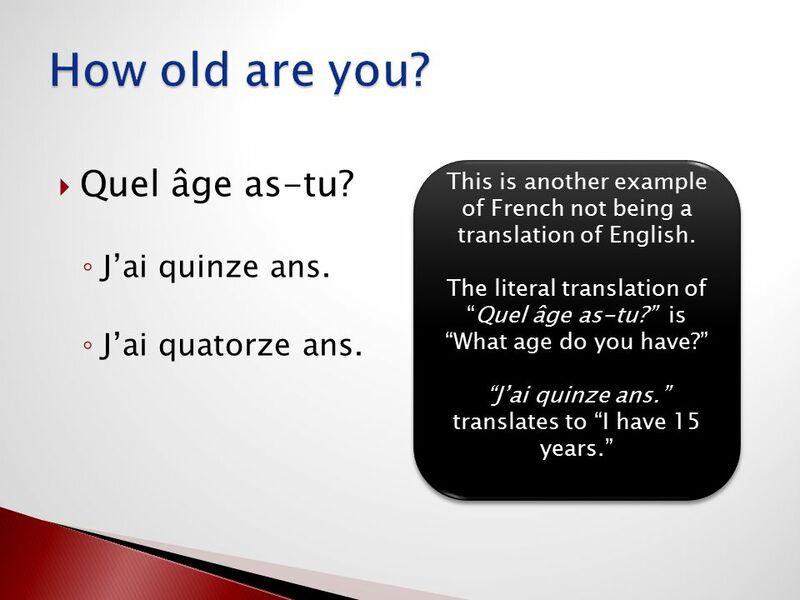 16  If you believe that you can speak French, you will be able to speak French. 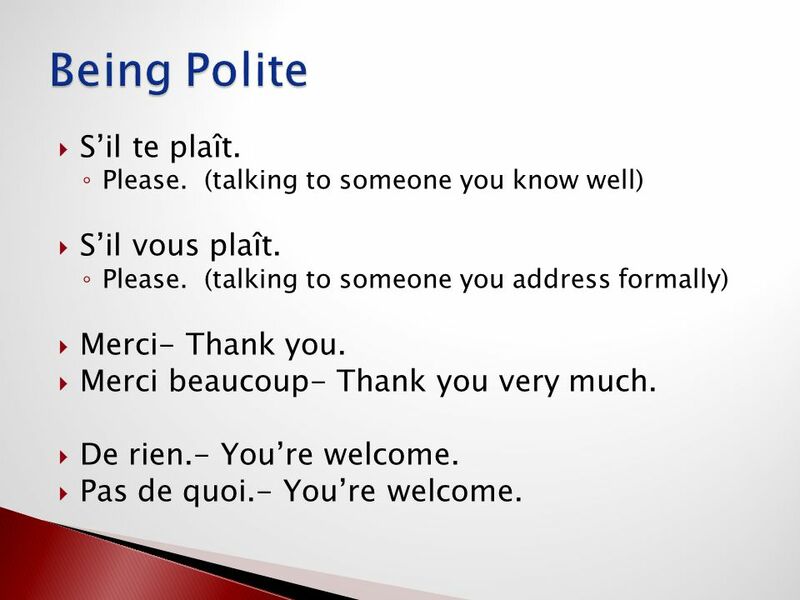  Be polite. 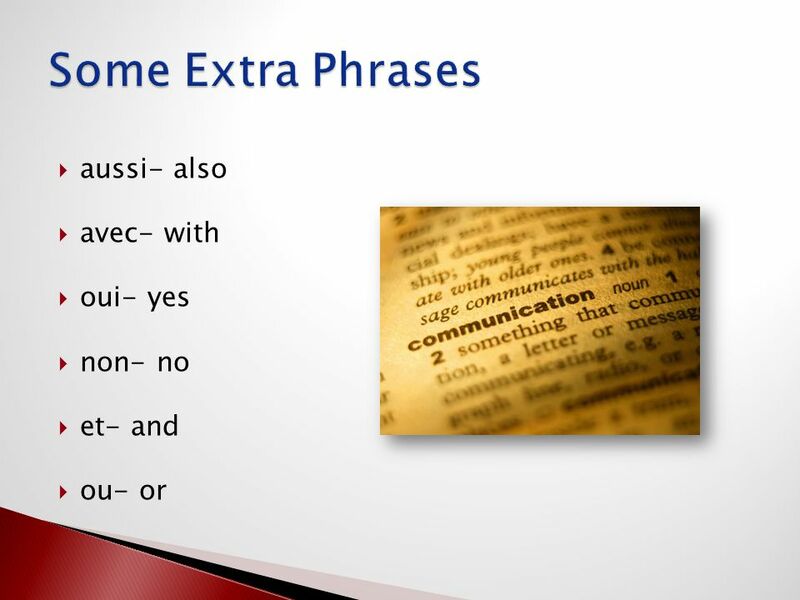  Practice pronunciation.  If you need help, ask! 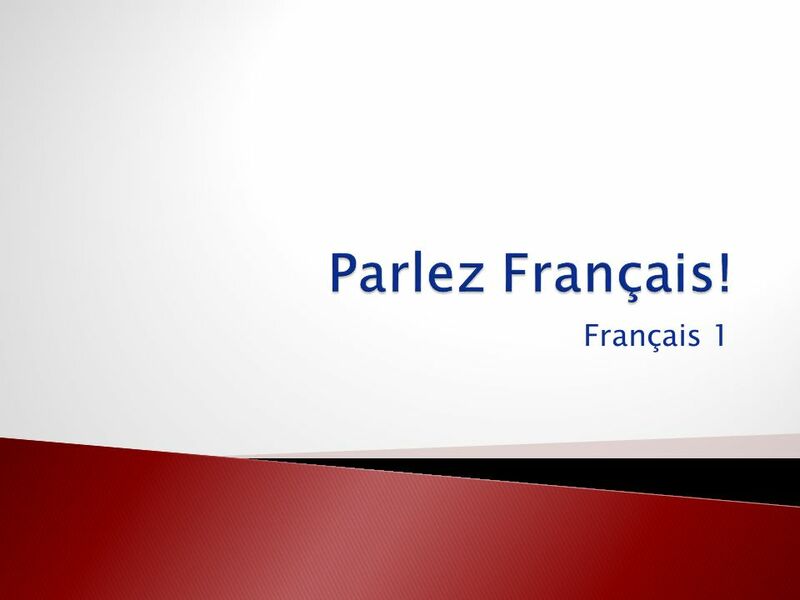 Download ppt "Français 1.  Bonjour! ◦ Hello! ◦ Good morning! ◦ Good day!  Bon soir! ◦ Good evening!  Bonne nuit! ◦ Good night!" Salut! Je m’appelle… Comment t’appelles-tu?. Salut! Je m’appelle… Comment t’appelles-tu? BIENVENUE… À LA CLASSE DE FRANÇAIS!. © Mark E. Damon - All Rights Reserved Another Presentation. Mon. Sept 9 th 2013 lundi le 9 septembre Sept th week (3rd week of 1 st 6 weeks) F 1 Book check Notes Makeup quizzes Prep for oral grade Handouts. 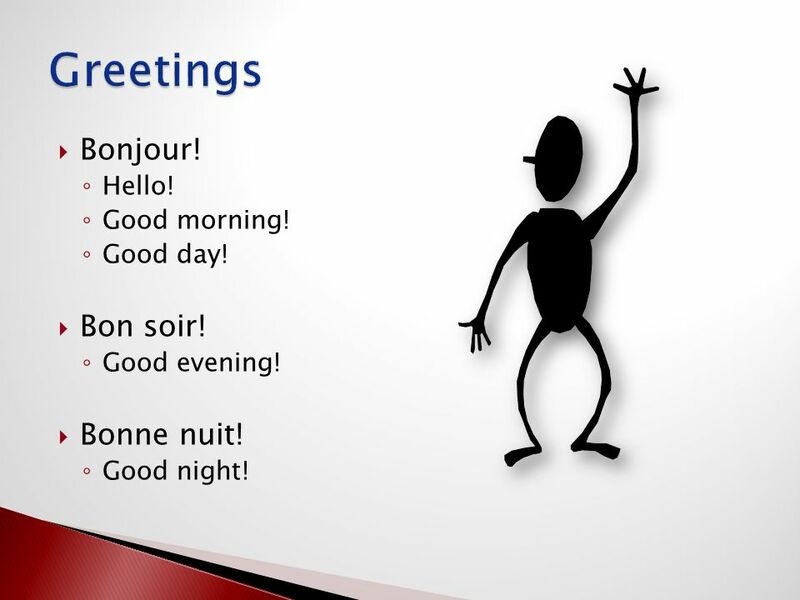 French Greetings. 1. When two young people meet, they say_________. FRANÇAIS 1411 – Mme Dodd FELICITATIONS!. Subjects and Verbs In English, sentences have a subject and a verb. The subject is the person or thing that is doing the action or that is being described. Parle-moi en français! Une révision des concepts de base. Allez, viens LVL 1 Ch 1 Vocabulaire.